Cafe owned in Grand Royal Hotel, Newest Weeds Restaurant and Cafe belongs to the Hotel Grand Aquila (5 starred). Although both offer a menu of healthy drinks, they have a different formula of vegetable and fruits juices. 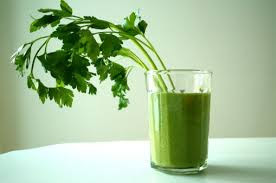 In seafood restaurant was called health vegetable juice green juice. According to the Area Manager of the Seafood restaurant, the drink menu is intentionally offered as neutralizers menu of seafood dishes that has a spicy flavor. "The menu is now the favorite. A lot of customer orders," Fresh healthy juice flavor is made from a mixture pakcoy, pineapple, lemon juice, and a little simple syrup (liquid sugar). "All the ingredients are blended together with ice cubes. The flavors are produced fresh, acid from lemon juice, and sweet from the pineapple," Give a green vegetable. While the flavor of the vegetables have been blended with other materials. This healthy drink menu offered IDR 17,500 per glass. Similar to the healthy menu in Seafood green juice, healthy drink menu Cafe using vegetable pakcoy vegetables as the main ingredient. The drink menu is named veggie combie. As the name implies, this menu is a combination of vegetable menu. Not only are vegetables, some fruits. So it feels like a fresh fruit juice. Healthy beverage made from a mixture of baby pakcoy, pineapple juice, jerus juice, lime juice, simple syrup, and ice is really fresh. The dominant flavor fruit juice making vegetable flavor is not too pronounced. Green drink menu offered by the cafe located at the Grand Royal Hotel is priced at IDR 35,000 per glass. Quite different from the previous two places that use pakcoy as a source of vegetables, Weeds Newest prefer using caisim. In the restaurant which sells typical Balinese dishes, vegetable juice is named green canyon. Green is the color of this juice. "This is a mixture caisim juice, pineapple, lemon, simple syrup, and ice cubes in a blender together until the texture is smooth," said supervisor Newest Weeds. To enjoy this menu, you have to pay IDR.18,000 per glass. At Cafe , caisim also used as a key ingredient in the manufacture of vegetable juice as Newest vegetation. But the drinks are named healthy blossom is proved not only contains caisim, there are also other vegetables and fresh fruits in it. There are three variants of this blossom healthy menu as expensive juice. The first variant is a mixture caisim, lemon juice, pineapple, lychee, and simple syrup. The second variant caisim mixture, lemon juice, carrot, lychee, and simple syrup. While all three variants Japanese cucumber mixture, lemon juice orange juice, carrot, lychee, pineapple, and simple syrup. "Besides caisim, there are uses carrot juice, and also for the Japanese cucumber vegetables. The fruit is pineapple, and lychee. In order to feel more refreshed, added too orange and lemon juice. Everything is blended together with ice cubes together," said a Public Relations Grand Aquila Hotel. Third menu is offered at a price of IDR 40,000 per glass. Oh. What an expensive the juice !, only the have could afford the high class healthy drink.